Zydeco is bouncing off the sixteenth-century bastion behind us. Umbria Jazz is in full swing. The green and grey slope of Monte Subasio sets off the fortress above Assisi with perfect clarity. A cool, dry breeze scampers up from the valley to the south. Postcard puffy clouds drift along above. We’ve seen the view before. It’s not new, says Jakob. He wants to go home. Wednesday he’ll get his wish. 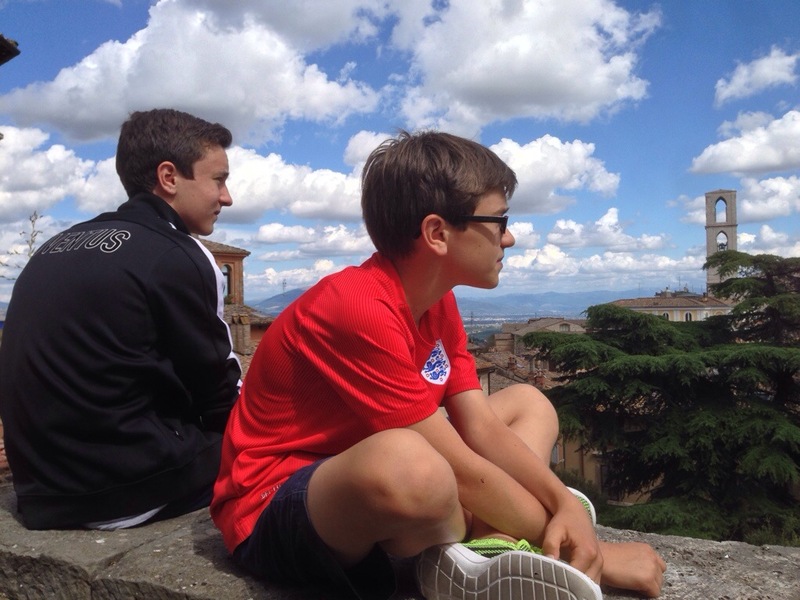 The last two days we were in Verona, 400 km to the north, for Simon and Jakob to compete in the Concorso Pianistico Internzionale “Remo Vinciguerra,” an international piano competition for young talents from age 5-14. Jakob’s teacher had encouraged him to play in the category of “quattro mani” (“four hands,” that is, two pianists on the same piano). However, a few weeks ago, Jakob’s planned partner quit piano, so Simon stepped in to play with him. Brothers two years apart don’t always play nicely together. Practices — when they happened — sometimes involved as much taunting and tangling as tickling the ivories. Nevertheless, they made progress, and after school on Thursday we set off for on the four-hour drive over the Apennines to the city of Romeo and Juliet at the foothills of the Alps. 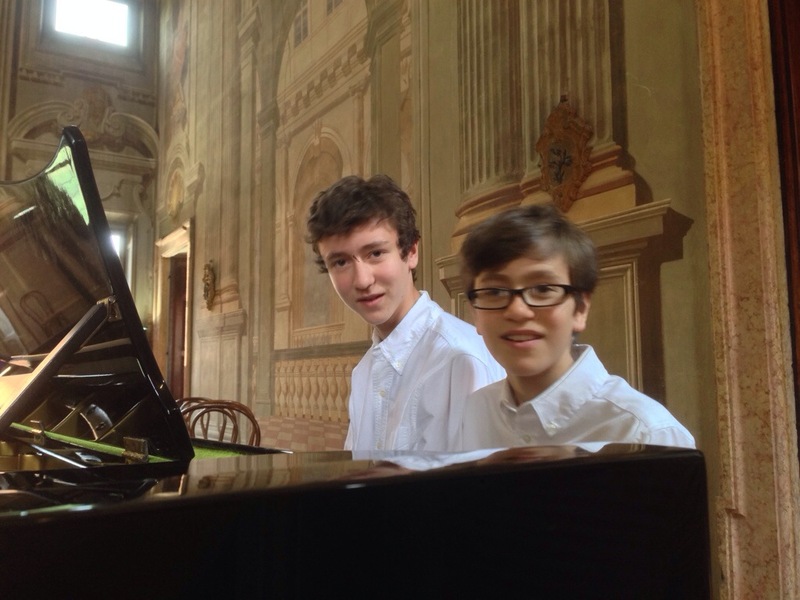 Last evening Simon and Jakob had their Spring 2014 recital at the Scuola Musica of La Banda degli Unisoni. They’ve been working hard all year, and while they need to work on smiling and engaging the audience, they enjoyed the experience. Simon on saxophone and piano; Jakob on piano. 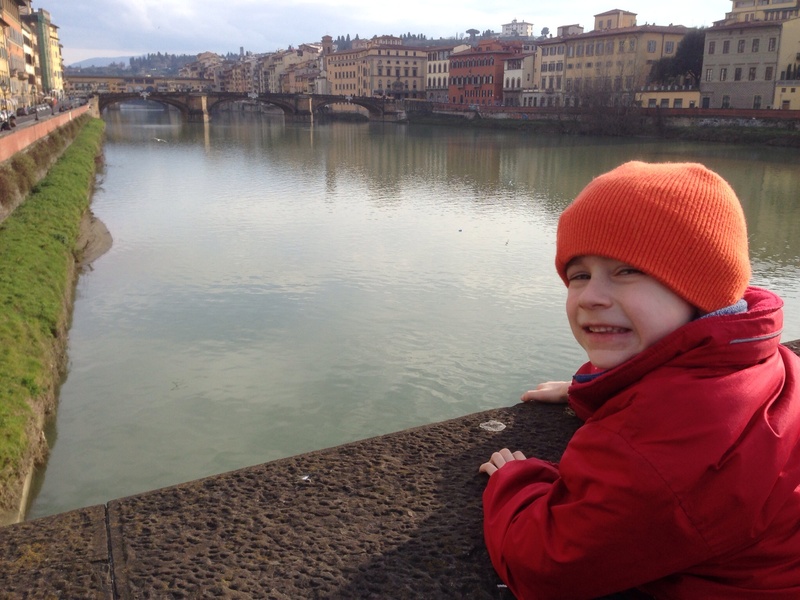 About to project his vocal cords towards the Ponte Vecchio in Florence. It is clear Micah loves music, especially singing. (And drums — but if we had them here, our neighbors would break down our doors.) Given how much music there is in Italy, and particularly in Perugia, perhaps it is not surprising that Micah is developing some operatic tendencies. So recently he sat us down for a concert of his own construction, accompanied by Simon on the piano (Schumann’s Knecht Ruprecht, Op. 68, No. 12, and Mozart’s Rondo Alla Turca, from Sonata in A, K. 331). If Micah’s friends and grandparents would enjoy a five-year-old’s five-minute opera, entitled “Yes, yes yes (if I gotta be so hungry)” here it is…(the flourish comes around 4:25). On Wednesday night, Jakob played in a cello recital organized by his teacher, Andrea Rellini. Jakob, inspired by Yo-Yo Ma’s visit to DePauw in 2011, began cello lessons with Eric Edberg in February 2013. His lessons with Andrea did not start until October. So far, Jakob has had about 10 sessions with his Italian teacher. After the other students played their individual pieces, the cellists performed as an ensemble.